Madeira, the largest island of the eponymous archipelago, serves as one of Portugal's top year-round holiday destinations. Although it draws a growing number of visitors, the island retains much of its relaxed atmosphere and provides an alternative vacation idea for travelers seeking a tropical paradise still relatively unspoiled by mass tourism. Your tour of Madeira might very well begin in the capital city of Funchal, which was settled in the 15th century. Madeira’s main town attracts the biggest crowds and serves as a convenient stopover for trans-Atlantic cruise ships sailing from the Caribbean. After exploring Fuchal's lively streets and beaches, hop on a boat tour of the archipelago for some whale watching or big game fishing. Funchal: Packed with some of the most popular places to visit in Madeira, including historical sites, museums, cathedrals, gardens, restaurants, and a large market, the capital of the island, named for its plethora of fennel, is maybe most well-known as the birthplace of famed soccer player Cristiano Ronaldo. Camara De Lobos: This tiny fishing village with a rocky beach and sheltered harbor--where you can watch fishermen unloading their boats--once served as Winston Churchill's summer retreat and is still a popular destination for summer Madeira vacations. Machico: The island of Madeira's second city served as the first landing of Portuguese explorers in 1419, though many residents believe the town dates back to 1346, when two star-crossed English lovers settled and died here after escaping their disapproving families. Porto Moniz: This little village along the northern sea is famous for its natural swimming pools and is dotted with large and small rocks and surrounded by pristine nature. Calheta: The rare natural beauty of this region provides the perfect scenery for long walks by the sea and hikes in the steep mountains and lush valleys, making Calheta the start of many sightseeing Madeira tours. Canical: This little fishing village and the oldest parish of Madeira Island has a rich religious tradition and its major attraction is “festa,” a religious procession during which the patron saint is brought from the chapel on the hill to a colorful boat chosen for the occasion. Santana: Dotted with small thatched triangular houses, this small village thrives because of agriculture, craftwork, and tradition and is a pure gem of its region. Its mountainous landscapes are covered by the Laurel Forest, which is listed as a World Heritage site. Canico: This laid-back town offers rugged beaches backed by cliffs and a lovely seafront that skims past chic hotels and terracotta-topped villas. Monte Cable Car: While seightseeing in Madeira, experience dramatic views of the city of Funchal, taking in the city's buildings, the bay, and the amphitheater as you travel up the mountainside on Monte Cable Car. Monte Palace Tropical Garden: The highlight of many Madeira itineraries, this beautiful garden features artwork integrated into the landscape, pathways along lakes with koi fish, and the local museum, which houses contemporary Zimbabwean sculpture and a collection of minerals and gems from around the world. Botanická zahrada Madeira: The indigenous and endemic collection of these gardens features more than 100 plants from Madeira and other Atlantic islands, while the bird sanctuary contains such a rare species, such as cockatoos or Loricos. Cabo Girao: This scenic lookout point with the glass-floored observation platform is popular among tourists for its views of the southern coast of Madeira Island, including the capital city of Madeira. Ponta de Sao Lourenco: Green cliffs, red stone chasms, sharp rocks protruding from the ocean foam, and valleys lined with palm trees make this a natural wonder that is virtually free from human influence. Pico do Arieiro: The highest spot on Madeira provides the vista of either endless chasms cutting through red-and-green colored hills or a soft carpet of white clouds rolling along, depending on weather conditions. Madeira Story Centre: History buffs find this spot to be one of the most popular places to visit in Madeira, as it features busts of historical characters and pirates, and also offers a panoramic view of Funchal's Old Town through the binoculars from the terrace. Blandy's Winelodge: Here you can observe Madeira winemaking practices, hear the company's stories, and learn about its history, or purchase a golden vintage and a deep, dark-brown vanilla spiced Madeira bouquet. Santa Catarina Park: This peaceful city park boasts many benches and areas to sit back and relax, read, or simply people-watch while listening to trickling fountains. Igreja de Nossa Senhora do Monte: This Jesuit church, which is the final resting place of the last Habsburg emperor, Charles I, offers a peaceful place for reflection as well as expansive views of Funchal and surrounding areas. Madeira might not be the first destination that springs to mind when considering a family holiday since few hotels have facilities like a children’s playroom or indoor and outdoor pools. Still, its mild climate makes discovering the island’s amazing outdoors pleasant any time of the year. Your family tour of Madeira might very well begin in the capital Funchal, which boasts half a dozen public gardens, an historic district, two old forts, chic hotels, and lots of family-friendly eateries. Your next stop can be the first human settlement on the island, the eastern city of Machico, which is smaller and less cosmopolitan than the main town, but also a real treat with its pedestrian-only historic district, a large park with a playground and, best of all, a golden sandy beach. The island compensates for a lack of sandy beaches with a number of volcanic pools that make it feel like a tropical paradise created by natural phenomena, which sit near the small town of Porto Moniz. Madeira boasts many interesting cultural and historical highlights and a number of authentic villages, but the thing that attracts visitors the most is its paradise-like natural surroundings. Your children will love the variety of outdoor activities the island has to offer, such as “levada” walks, open-top sightseeing buses, jeep safaris, helicopter rides, Monte Cable Car ride, mountain bike tours, and catamaran rides. Discover the lush wilderness and rugged landscape of Portugal's famous island at Madeira Adventure Kingdom. Of course, the island offers many water sports, such as surfing and sailing, or diving and snorkeling at Anthia Diving Center. Set in a rebuilt 18th-century fortress, Aquario da Madeira is home to different species like dolphins, turtles, and whales. Visiting Sao Vicente Caves & Volcanism Centre will almost surely be a highlight of Madeira vacation for your child. At the massive Monte Palace Tropical Garden, kids can walk through labyrinths and tunnels, over bridges, and next to waterfalls and fish ponds while exploring a plethora of exotic plants. In the past, Madeira mostly attracted couples and other travelers without children. However, in August, when the Portuguese and Spanish take their holidays, the number of children on the island increases. To optimize your family vacation in Madeira, consider staying at a “quinta,” a traditional country mansion within a large farm estate. If you visit in June, you will catch the fireworks and Atlantic Festival. To experience the everyday charm of the island, take your kids to the local fruit and flower market and the fish market, which features exotic fresh fish. Note that some “levada” walks, being very long and narrow, are not suitable for children. The seductive gastronomy of Madeira is based on peasant traditions and simple ingredients, including succulent beef, garlic, and olive oil. Various kinds of fish and other seafood are featured in many main course dishes due to the long fishing tradition of the island. Meat lovers will find a large variety of deliciously grilled chicken, pork chops, and beef steaks, such as the traditional espetada--large chunks of beef rubbed in garlic and salt that are skewered and grilled. The local cuisine is not big on salads, but you can find locally cultivated vegetables on the menus as well as simple salads made of tomatoes, lettuce, grated carrots, and lots of sliced onions. To fill your tummy after a busy day on your Madeira holiday try açorda, a bread soup with poached egg, seasoned with garlic, winter savory, and olive oil. A favorite local cookie and Madeira's oldest sweet (that’s served practically everywhere on the island) is bolo de mel, which is a kind of honey cake. A sip of the world-renowned Madeira wine showcases local flavor. If you prefer something richer in taste and more refreshing, try a local version of mojito, the traditional poncho, or the nikita, a drink made of beer, ice cream, and small pieces of pineapple. Madeira Island and especially its capital offer many possibilities for shopping, including modern shopping malls, classic boutique style shops, small family-owned businesses selling handicrafts, and green open markets where farmers sell tropical fruits, vegetables, fish, and exotic flowers. Situated within the tourist and hotel zone, the large art deco Workers Market brings together the island's scents, colors, and flavors. The modern Forum Madeira and airy gallery-style architecture features a good selection of shops different than the expensive tourist ones. Note that many of the large chains of shops are cheaper in Madeira comparing to the rest of Europe. If you are looking for a souvenir to bring back home from your Madeira holiday, visit one of the specialized Madeira wine lodges and shops, embroidery shops in the center of Funchal, or Charlotte's CM Studio. Wicker products and Madeira long-lasting flowers, such as orchids and flamingo flowers, will also make a perfect gift. Livraria Esperança, one of the biggest bookstores in Europe and a reader’s paradise, will turn you into a "bookworm" if you’re not one already. It seems that explorers knew of Madeira long before the island was discovered by two Portuguese sea captains. One of the first mentions of the islands of Madeira and Porto Santo are found in the writings of the Roman historian Plutarch, who describes them as the Isles of the Blessed. Though the islands were formally not discovered until the 14th century, archeological excavations uncovered traces of the Vikings who visited the island in the 10th century. Legend has it that, almost a century before the two young sea captains were sent by Prince Henry the Navigator to explore the coast of West Africa, two young lovers went aground along the coast of Madeira while fleeing from England to France. The two captains were driven off their course by the storm just like the two lovers before them and in 1419 they found land on a small island that they named Porto Santo. A year after that, they discovered the heavily forested island of Madeira. The two islands were colonized by the families of captain-majors, a small group of minor nobility, and some convicts who worked in the fields. The building of the irrigation canals “levadas,” which are still in use today, boosted agriculture, especially sugar cane production. Museu Quinta das Cruzes where Zarco, one of the captains who discovered Madeira spent the last years of his life, features the black-and-white photographs of old Madeira and the paintings that will help you understand how the country has prospered. Another stop history buffs should make on their Madeira tour is Madeira Story Centre where interactive displays about Madeira's history and culture are presented chronologically. In the 17th century, the production of the world-famous Madeira wine, which was considered the most luxurious beverage for the colonial Western Hemisphere, began. Since then, Madeira wine has been the most exported product. Around that time, St John the Baptist of Pico Fort, which was originally built as the eastern gate of Funchal, was converted into a fort that was supposed to protect the city from pirates. To learn more about the history and practices of winemaking on your Madeira vacation, visit Blandy's Winelodge. During the Napoleonic Wars, the British Empire colonized Madeira, but in 1814 they returned the island to Portugal. During World War I and World War II, the waters that surround the island became a battlefield, which brought immense damage to the economy. The imposing building of Museu Militar da Madeira houses exhibits on the island’s colonial and military history, including its attempts to stay neutral in World War II. Over the centuries, Madeira strived to gain more autonomy from Portugal. Shortly after the democratic revolution of 1974, Portugal granted full political autonomy to Madeira. The official flag of the island was first raised in 1978, even though Madeira chose to remain part of Portugal. The captivating landscape of Madeira is the primary cause why this destination lures tourists year-round. This colorful volcanic island earned its title of “Pearl of the Atlantic” for more than one reason. The volcanic mountain range cascades gently into valleys and runs seamlessly through vineyards, which produce the world-renowned Madeira wine. A ride on Monte Cable Car provides stunning views as you travel above the city of Funchal up the mountainside to reach the village of Monte. The island owes its name to lush green forests rich with flora and fauna. If you are a nature lover, be sure to add Laurel Forest, listed as a World Heritage site, to your Madeira itinerary. The most beautiful scenic trails that offer panoramic vistas lead alongside “levadas,” the medieval irrigation channels made of stone that bring the water from the northwest to the southern parts of the island. 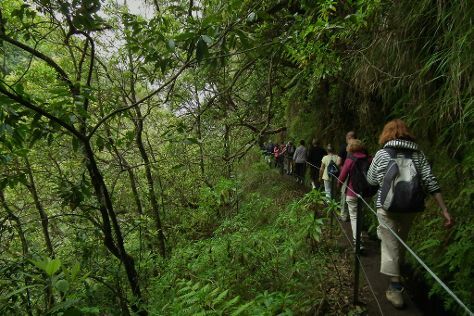 Join Madeira Explorers for a full-day hike or an easy stroll. Madeira’s beaches are not sandy like the ones on the nearby island of Porto Santo, but the volcanic sea pools and caves make them especially charming. Madeira is also known as the "flower island" because of exotic flowers, such as orchids and flamingo flowers, that bloom in its many gardens. Madeira observes the same public holidays as mainland Portugal, many of which coincide with the most important religious holidays--Christmas, Easter, Assumption (August 15), and Immaculate Conception (December 8). Apart from that, Madeira Day, marking the anniversary of the island’s independence from mainland Portugal, is celebrated on July 1. If you are planning your Madeira vacation with traditional festivities in mind, note that one of the biggest street parties in Europe and the most colorful festival on the island is Madeira’s Carnival in February. The month of April is reserved for Madeira’s flower-festival and the festival of gardens where you can admire a myriad of flowers filling the main streets of the capital. Madeira Wine Festival, held in September, revives old wine-growing traditions and recalls the social and economic importance of Madeira wine. July is the months of jazz and folk music festivals in Funchal, Santana, and at Santa Catarina Park, while in November the Funchal International Film Festival is held. Thanks to its mild climate with temperatures between 20-27 C (68-81 F) throughout the entire year, Madeira has become known worldwide as the islands of eternal spring. The warm ocean currents around the island and the winds help dictate the climate. Although Madeira is closer to Africa than to the European coast, summers are extremely comfortable due to the cooling winds that brush across the island. When planning your Madeira vacation, avoid the rainy season, which is between November and February. However, note that the temperatures can reach as high as 40 C (104 F) when the hot summer “Leste” wind blows across from North Africa. Sheltered by the high mountains, the island’s capital is generally somewhat sunnier and drier than other parts of the region. Three main bus companies provide services around the island and taxis and rental car agencies are available in the major cities and tourist areas. Bus is the cheapest way to move around the island, but note that the timetables can be confusing since the route details are not always clear. Taxi fares are fixed and based on destinations within a city, while longer intercity routes are charged by kilometer. Renting a car provides additional comfort and freedom and is a great way to tour the island. To add some excitement to your Madeira vacation and to connect to the nature of the Garden Island, join one of the biking tours, but make sure to go with a proper guide. The official language of Madeira is the southern dialect of Portuguese, spoken with a heavy accent.